"Commedia degli Zanni", "Commedia dei Buffoni", "Commedia dell'Arte". We are in the second half of the sixteenth century. The actors raise their profession, until then considered as low and infamous, to the rank of art, bringing it in a few years from the squares to the places of power of the time: the European Courts. The art of the actor is recognized, the professionalism of the theatre is recognized. The actors create characters close to the characters of the people, they steal from the types to the daily life and make them accessible to every public, make them universal and for this they stylize them, make them grotesque. They use masks for their purpose. This is how the mask, whose roots lie in the feasts and rituals of the Carnivals of the Middle Ages, becomes a tool, a work tool, like that of any craftsman, as well as a grotesque medium. The Commedia dell'Arte, on the other hand, converts the actor into a theatre artisan capable of transforming the materials of everyday life into a repertoire to be used on the scene. The Commedia dell'Arte will then go on to the history of theater as "Improvisation Theatre". For years we will give the term "improvisation" a legendary meaning, as if everything that happened on the scene was none other than the fruit of the actor's inspiration in a moment of dramatic intuition. Nothing could be falser. And nothing more studied and worked, even chiseled, of the improvisation of “dell’Arte” comedians. These were real partitions that the actors passed from generation to generation as if they were tools, the tools of art. They were handed down for "Centoni". These were a kind of breviaries, preciously guarded by every actor, containing excerpts of scenes, jokes, comic games, songs, from which actors could draw at the moment of improvisation. And the "Centone" of each actor was enriched during the career that was inextricably linked to the life of the character that actor played. Theatre of professionals united in companies, companies able to resist over time as "I Gelosi" of which we have news for more than fifty years. This means the vitality of an artistic form as well as adaptation to different historical conditions. Theatre of professionals and theatre to export, since in a few years the Commedia dell'Arte, born in the triangle Venice-Bologna-Milan, is exported throughout Europe with great success. So, a theatre accessible to every public, a popular theatre that goes beyond linguistic and regional barriers. If an artistic expression comes from an adaptation, a stylization of reality, the search for an audience and the need to cultivate its tastes, so the Commedia dell'Arte proposes universal types, simple and direct languages, a popular theatre which soon becomes universal. The study of masks and of their use in the Commedia dell'Arte leads to a vision of theatre where the actor sees himself as an artisan creating his own art. In the use of masks, the comedian finds an enjoyment and within the context of the code given by the mask, the actor must reveal the profound truth of the character he represents, so that this truth becomes universal, exteriorized but never exterior. 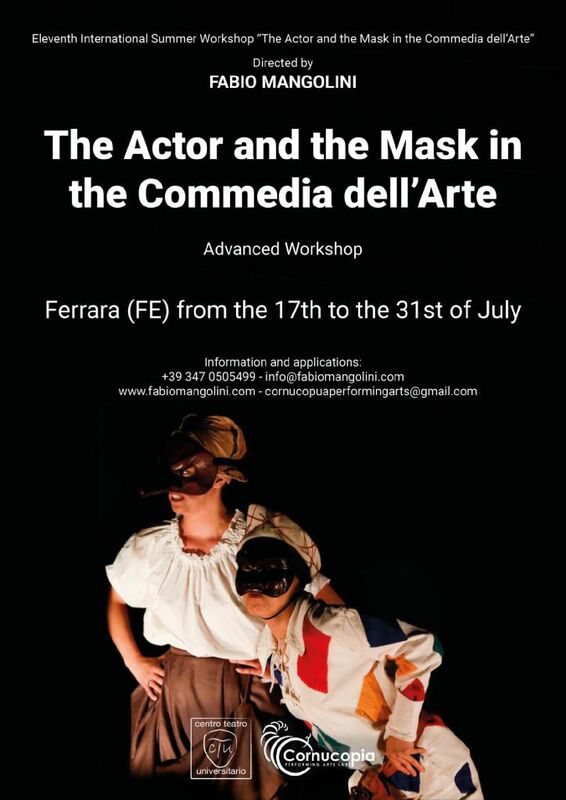 The mask and the Commedia dell'Arte need actors with a solid background and great qualities: this is a total theatre involving interpretation, mask work, singing, acrobatic, mime and fencing. Finally, it should be noted that the mask serves two functions: the first one is theatrical, in the service of the performance; the second is educational, to develop the skills of the actor, even when the mask is removed. Duration: From 17 to 31 July 2019, eight hours a day.